Wellness is a buzzword in the benefits world, and most companies have a financial wellness benefit in place now or plan to offer one soon. The idea of helping employees with their money is more popular than ever. But many companies are still searching for a clear sense of what financial wellness means. To get your employees the help they need, you first need to understand true financial wellness. It’s essential to see the role of behavior and realize that just providing someone with information is rarely enough to inspire enduring results. Research clearly shows that most of your employees already know what they need to do to get in better shape financially—the question then becomes what will they do with that knowledge? It’s the all-important issue of how to convert head-knowledge into holistic behavior change. And it’s a problem you can help your employees solve through the right financial wellness benefit. For your financial wellness program to be truly beneficial to your company, you’ll need stated goals about what you want to accomplish as well as ways to measure how good a job the program is doing in helping you hit those goals. Let’s examine how the right information can be harnessed for long-lasting financial wellness in your organization. Here’s a number everyone interested in helping their employees experience real financial wellness should know: 15%. That’s the amount of income financial experts agree everyone should be saving to ensure they stay on track to retire with dignity. Granted, there’s more to financial wellness than investing, but it’s an undeniably large factor. In addition to the experts, guess who else thinks investing is important? Your employees. The truth is most Americans know they ought to be saving for retirement, but few are saving enough. What’s behind that disconnect between what people say they want to do and what they actually end up doing? The gap between plans and performance continues because hitting wellness goals is always hard work. And putting off the big step of saving for retirement isn’t the only area of wellness where Americans procrastinate. To see how hard the struggle for behavior change is, consider some popular health goals. Company 401(k)s nationwide are being shaped by the same behavior-change challenges. Although 95% of Americans in 2017 told TIAA that “freedom from financial concern” was an important part of how they define success in retirement, that aspiration is hardly backed up by Americans’ savings habits. (3) In reality, a 2016 report from the Financial Times revealed roughly 45% of working-age households have zero retirement savings. (4) To put it plainly, most workers already know they ought to be preparing for retirement, but about half appear to be ignoring that fact! As you can see, wishful thinking often falls short—sometimes painfully short—of hitting ideals. That’s just as true with money as any other area of life change. Just as most smokers know they ought to quit, most of your employees know the basic truth that they ought to be saving more for retirement. But their behavior with money says otherwise. Many of your employees are either under-investing or neglecting it entirely because of stubborn debt and paycheck-to-paycheck living. The failure to follow through often stems from deep doubts about their ability to change the longstanding habits preventing them from starting. 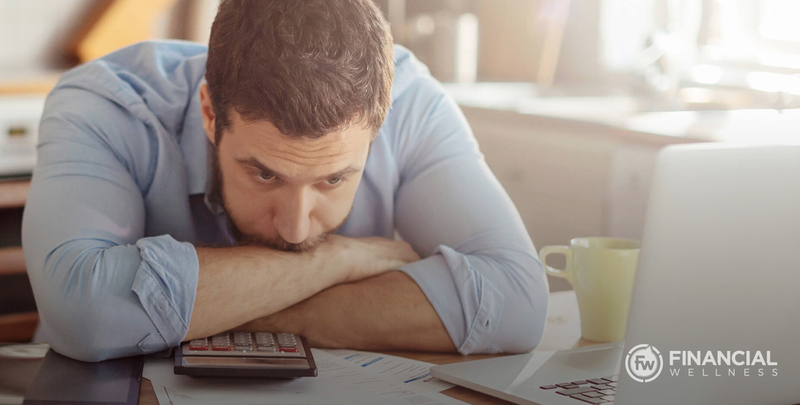 Considering the awful state of personal finances nationwide, it’s likely your program will need to begin by helping your employees lay a solid foundation with their basic money habits. That will mean inspiring change in areas like budgeting, debt and emergency savings. The trouble isn’t just with debt, or just with a lack of savings—there’s an underlying lack of big-picture understanding. The basic failure to budget causes a desperate lifestyle for a lot of the people in your company. And the lack of budgeting know-how is not limited to those with fewer dollars—it applies across the range of incomes, with top earners often struggling just as much to make ends meet. The point is, most employees don’t need more education on mutual funds, the stock market or investment forecasts—they need the tools and coaching that help bridge knowledge and action, helping connect the status quo to their desired future. A holistic financial wellness program which emphasizes behavior change makes the idea of budgeting accessible to your team by meeting them right where they are, regardless of income or debt levels. No one wins without a written plan and specific goals for their money. You need a program that is easy to follow, with fun and engaging content. It should guide them step-by-step along the way to financial wellness. All companies need a financial wellness program that meets its employees’ needs while also generating enough participation to justify the investment. What does that look like for your company? Despite the spread of financial wellness benefits, many companies still have no metrics in place to prove success. Getting your employees the best financial wellness information available is great, but it’s essential that you find out how much impact it’s making in their lives. Participation – The number of employees signing up for the program is a good indication of need, and if participation grows and stays high you’ll have a good sense of how well it’s working. Engagement – A great program should be personalized to wherever employees find themselves while pursuing financial wellness. Online platforms allow convenient access to materials and let them easily track progress. The total amount of debt paid off and money saved – It helps both your employees and you to see this number grow over time. It’s encouraging to see the debt vanishing and the savings growing. This is also a real measure your company can use to find out how much behavior is really changing company-wide. As your financial wellness program takes off, you can expect to see higher participation rates than the usual 7% we see with other benefits—after all, more people have a need for this information. Don’t get discouraged if there aren’t immediate dramatic results for your company’s 401(k). That’s because true behavior change takes time, and broke people have little or nothing to invest, even if they’ve finally seen the truth about the best personal finance practices. But there are some obvious areas where you and your employees will get some quick wins, like bigger emergency funds and a decrease in retirement plan loans—which in itself is a huge win. Growth of participation and savings levels in your company 401(k) will also rise over time as your employees adopt and maintain smarter money habits. In the meantime, use the best metrics to stay focused on measuring every little step of progress as you (and your team) move the needle all the way to financial success. Take the next step toward improving you employees’ financial wellness by getting a free company retirement plan assessment at FinancialWellness.com.